Stay in comfort at the rustic Wolf Den Bunkhouse ‘n Cabins Hostel close to the entrance of Algonquin Park from Friday evening until Sunday. The hostel is approximately a three hour drive north of Toronto, on Highways 400, 11, and 60. The closest major urban centre is Huntsville on Hwy 60. Visit www.wolfdenbunkhouse.com for more information about the Hostel. Enjoy the company of fellow enthusiasts while reveling in and celebrating the end of summer. Provided will be a Friday burger dinner and snacks, two breakfasts, and supplies for two sandwich style lunches. Saturday evening will be a pot luck (group) dinner. We have the entire hostel booked for the weekend. There are six buildings. 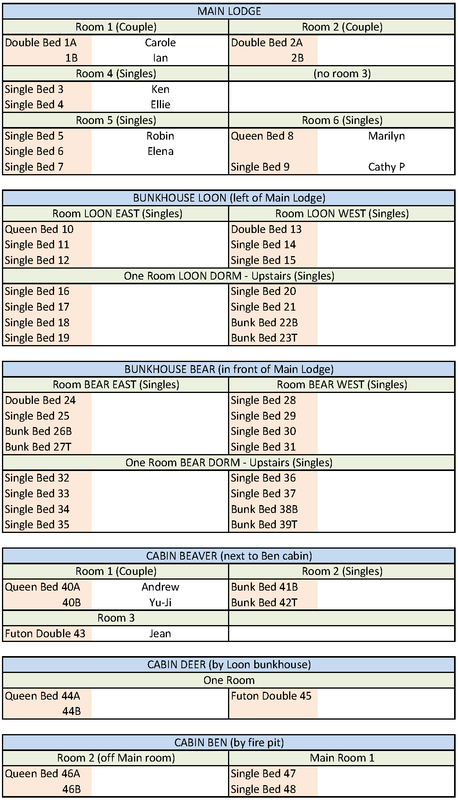 The Main Lodge, the Loon cabin, the Bear cabin, the Beaver cabin, the Deer cabin, and the Ben cabin. The Main Lodge has washrooms, showers, cooking, and eating facilities as well as bedrooms down stairs. We will eat meals together here. There is a washroom cabin with showers for our summertime use. Choose a bed for yourself and your friends when signing up. View the room and bed layout graphic on the right. We will try to keep this list up to date - it's a manual process. The area offers on road and mountain bike cycling, hiking, and canoeing/kayaking. Enjoy the quiet country roads, hiking the Algonquin trails, or dipping your paddle in the clear lake water. The cost is $135 for TBN members and $145 for non-members. Please register online for this outing. If you wish to pay by cheque download the sign up sheet below. Potluck Dinner - Saturday night dinner is a group effort, bring a dish you wish to share. BYOB - alcohol is welcome if you are so inclined. Bathing suit - there is a sauna cabin, and water everywhere. Plates, cups, and cutlery – the hostel has everything you need. Bedding, linens, comforters, and towels – these are provided by the Hostel. Notes: Log in first to get the member rate. Cancellations are manual. Contact pbtrips@tbn.ca with questions. Rooms and Cabins will be filled by gender, unless you specify otherwise. Sign up early to avoid disappointment. Click on the above to view full screen. This bed graphic is manually updated. Note: your internet browser may cache it and not show the most recent version; click on it's "reload current page" button to refresh.